Close to 750 geospatial data sets covering themes such as business and economic development, demographics, environment, land use and zoning, public safety and service, transportation, and more! Most data sets can be accessed as web services or downloaded in shapefile (.shp) format for use with a desktop GIS. What BTAA Library submitted the collection? Looking to study neighborhood development and regional growth in the D.C. area? Check out the annual building permit data sets from 2009 to the present. Need to get around town during this year’s AAG Annual Meeting (April 3-7) or UCGIS Symposium (June 10-13)? 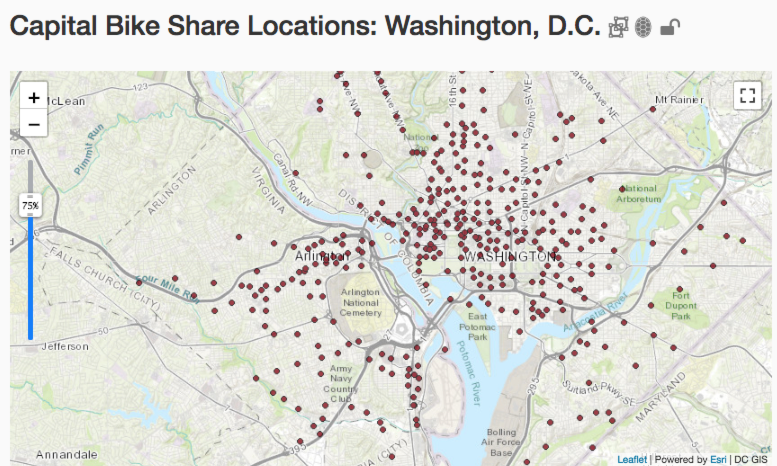 Skip the taxi, and grab a bike from one of D.C.’s many Capital Bike Share locations. Browse the full collection of open data sets and check out government apps published with ArcGIS Online (like HistoryQuest DC): http://opendata.dc.gov/. Learn more about the University of Maryland Libraries GIS and spatial data services: https://www.lib.umd.edu/gis. Have questions about this collection, the BTAA geoportal, or maps and geospatial data in general? Please don’t hesitate to contact our project team! Joshua Sadvari is the Geospatial Information Librarian at The Ohio State University Libraries.